Are Pecans Good for Your Cholesterol Levels? Are Pecans Healthy for Your Cholesterol Levels? Pecans are not just for pies. In fact, studies are showing that there is more to this nut than its delicious taste. Pecans are healthy nuts that come from the pecan tree (Carya illinoinensis), which is a tree primarily grown in North America. In fact, the name “pecan” was bestowed on this nut by North American Indians to describe the need to use a stone to crack its shell. Although they are used extensively in many recipes, pecans have also been garnering new appeal as a food that may help to keep your cholesterol levels — and heart — healthy. Do Pecans Really Lower Cholesterol? Studies looking at pecans have suggested that they have the ability to lower cholesterol, similar to other nuts such as walnuts and pistachios. These studies involved individuals with normal or high cholesterol levels following either a controlled diet or no specific diet at all. Although the studies involving pecans are limited, they have suggested that pecans have the ability to lower total cholesterol levels by at least 5% and LDL cholesterol by up to 10%. The results concerning HDL cholesterol are conflicting. One study has suggested that pecans may raise HDL cholesterol up to 5% whereas another study suggested that pecans may slightly lower HDL, however, these results were not significant. In some studies, triglyceride levels do not appear to be greatly affected, whereas one study showed that including pecans reduced triglycerides by at least 11%. In a couple of the studies involving consumption of pecans, the biggest benefit was seen within one month. However, after two months, LDL and total cholesterol levels appeared to slightly rise. The fact that this lipid-lowering effect appears to be temporary means further exploration is needed. How Do Pecans Affect Your Lipids? This lipid-lowering effect can be attributed to the high amounts of unsaturated fats contained in pecans. Unsaturated fats are found in many nuts and are considered heart-healthy since they can help keep your cholesterol and triglyceride levels in check. In fact, the Food and Drug Administration (FDA) has recognized that some nuts, including pecans, may have the ability to reduce the risk of heart disease. Because of this, the FDA has given approval for pecans to be labeled as a heart-healthy food. Pecans are also high in phytosterols and fiber — two, additional cholesterol-friendly nutrients that have also been shown to slightly lower LDL cholesterol levels in some studies. So, are pecans really heart-healthy? A few studies suggest that they are good for the heart because of their ability to help lower your cholesterol. Most of these studies involved consuming 1.5 to 2 ounces of pecans a day, which is roughly a handful. When substituted for other snacks — such as crackers or chips — pecans, or even other nuts, may be able to help lower cholesterol. Despite their high-fat content, most studies found that their participants did not gain weight by consuming pecans. Instead of raiding the snack machine, consume a handful of pecans as a snack to ward off the munchies. Healthy pecans should be low in salt without other high-calorie ingredients added to them, such as butter, fudge, or sugar. Eastman WA, Clayschulte BJ. Pecan effects on serum lipoproteins and dietary intakes of hyperlipidemic individuals consuming self-selected diets. Fam Cons Res J 2005;33:197-207. Hudthagosol C, Haddad EH, McCarthy K et al. 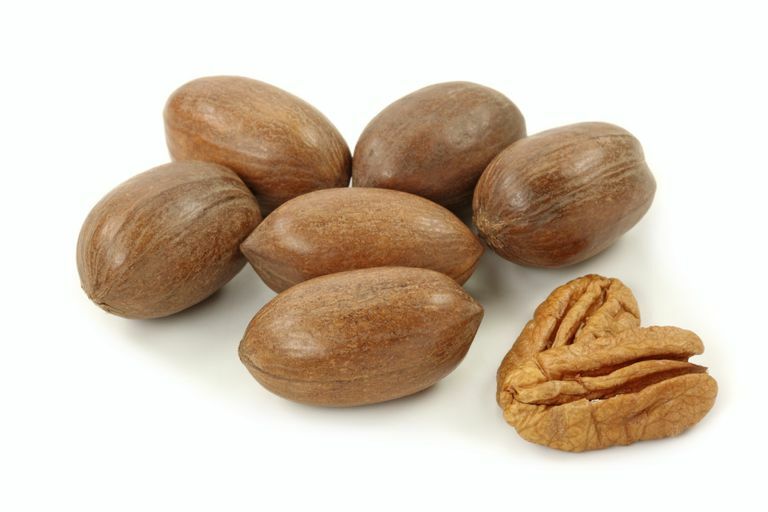 Pecans acutely increase plasma postprandial antioxidant capacity and catechins and decrease LDL oxidation in humans. J Nutr 2011;141:56-62. Morgan WA, Clayshulte BJ. Pecans lower low-density lipoprotein cholesterol in people with normal lipid levels. J Am Diet Asso 2000; 100:312-318. Rajaram S, Burke K, Connell B et al. A monosaturated fatty acid-rich pecan-enriched diet favorably alters the serum lipid profile of healthy men and women. J Nutr 2001: 131:2275-2279.